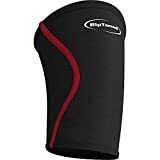 Active recovery is an important part of any weight lifter’s workout routine and a good elbow compression sleeve can help you overcome an injury faster. 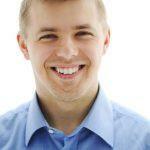 If you want to make sure you get yourself the best product you have landed on the right page. 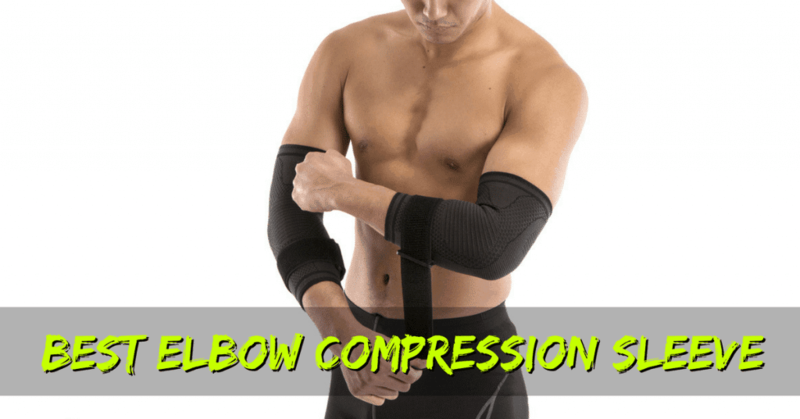 In this article, we are going to tell you what are the exact things you need to look at when searching for an elbow compression sleeve. We are also going to look at some of the bestselling products out there. So stay, tuned because some of these items have quite a few shortfalls, even though they are ranking high on Amazon. What Is an Elbow Compression Sleeve? Why Should You Buy an Elbow Compression Sleeve? What to Look for When Buying an Elbow Compression Sleeve? The elbow compression sleeves by Nordic Lifting come in a pair and are design specifically for the athletes. These sleeves are made out of nylon, using both spandex and latex for the best compression. The length of the sleeves is enough to cover a pretty large part of your forearm as well. 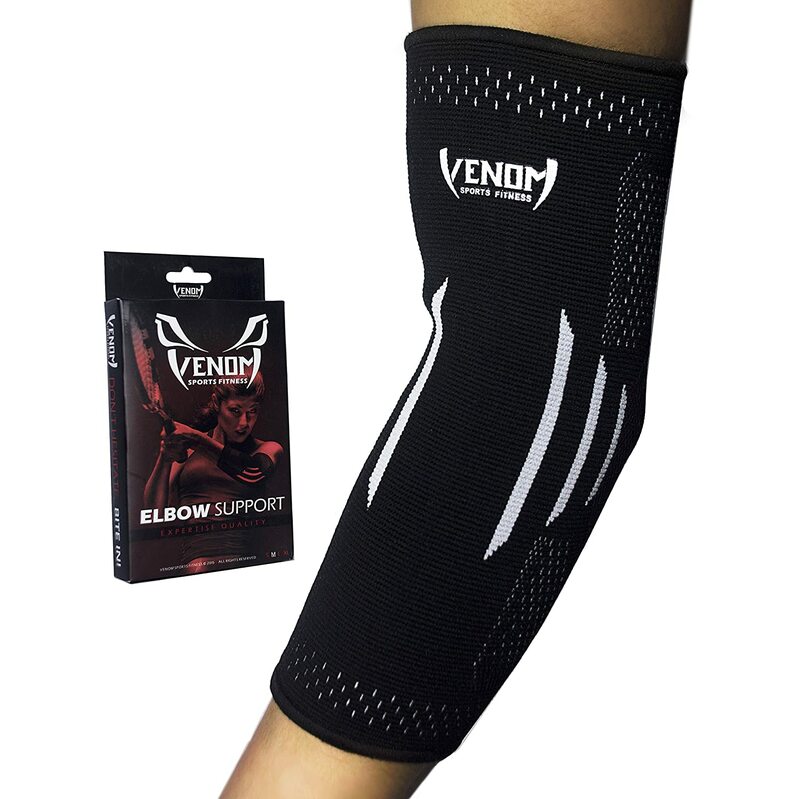 So, if you need support for both your elbow and upper part of the forearm this product might do the trick. The sizing is quite accurate – all you need do to is measure your elbow circumference and pick the right size from the chart. But you also want to consider your biceps circumference when choosing the size. Several users reported these are a little bit too tight on the upper arm when selecting the size just based on the elbow circumference. Of course this will depend on your muscular development. So, keep this in mind as well when shopping. 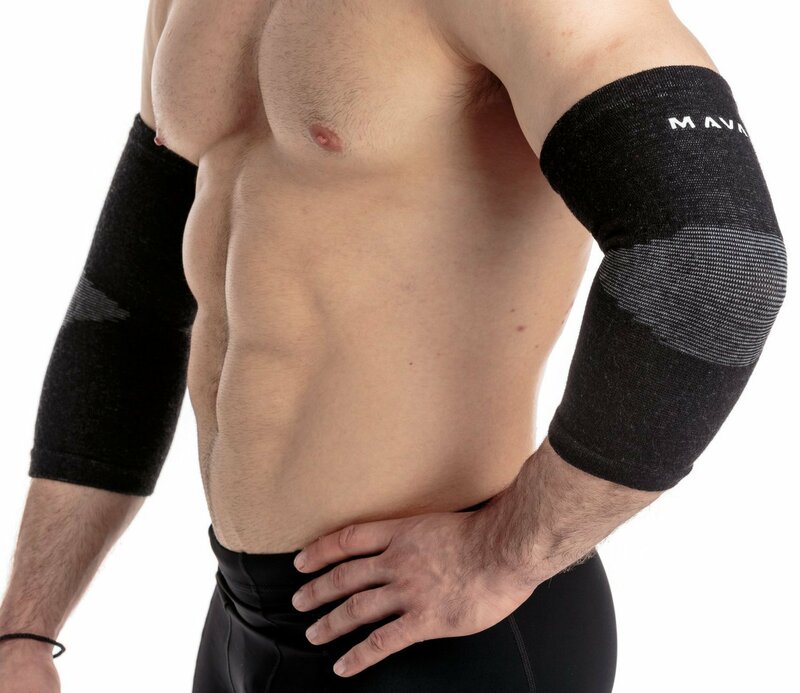 The elbow sleeve by Mava Sports will keep everything around your elbow area nice and tight. The design and materials they used puts most of the compression around the elbow area. Unlike other elbow sleeves which put the same amount of compression all over your forearm and bicep, there really put all the focus on the elbow. The product has a nice feel and the nylon they used seems premium quality. One downside is that it’s a little bit thicker than what you would expect. This might also cause some restrictions on the range of motion of your arm and elbow joint. Another minus is the finish of the stitching around the ends of the sleeve which might dig into your skin. In terms of sizing, there really are no issues if you correctly measure your elbow. No matter how big your forearm or bicep is, this product will fit. This is probably the biggest length elbow compression sleeve you can buy. Of course, this can be looked at as both an advantage or a disadvantage. The advantage is that you will benefit from very good forearm support, in case your tendonitis runs down from your elbow. The disadvantage is that you also get a lot of compression on your biceps, which you might not like. It gets really uncomfortable when you get a pump, during your workout. The fabric is super comfortable, it is thin and it will allow you to more freely. It also offers a really good grip so you will not have to worry about readjusting the sleeve. On top of that, on each end it has an elastic which keeps it from rolling down. This is a very stylish and nicely designed elbow sleeve. The black neoprene material with red striping looks better than most elbow sleeves out there. It is not as long as other elbow sleeves, which means you will not benefit from any forearm support. But the thick neoprene does a very good job at keeping the elbow tight. Despite the thickness of the neoprene (5mm), the sleeve doesn’t hinder mobility and the range of motion. You will also get a zipper pouch together with the sleeve so you can keep it nice and clean in your gym bag. There are users who reported that this elbow sleeve gets a little bit lose after you wear it long enough. Most likely this happens because of the neoprene material which tends to loosen up, unlike nylon for example. 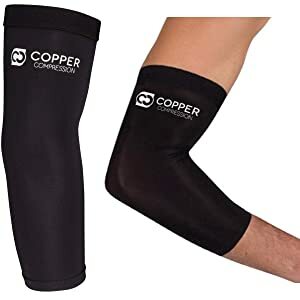 This is one of the bestselling elbow compression sleeves which stands out thanks to its high copper content. It comes in 5 different sizes to fit anyone’s arm. The length is the same in all sizes and the tension it puts on your elbow joint and tendons in just right. Users reported some issues with the size, so you might want to measure your arm twice before ordering. Otherwise, the compression sleeve could be either too tight or too lose. It is made out of a synthetic material which feels very smooth and comfortable. It’s not bulky at all and it will allow you to go through your workout or daily activities without too much discomfort. You will feel the tension on your elbow, you will know that it is there, but it’s not uncomfortable to wear. The downside is that the material lacks the grip due to the copper content. So you will have to readjust the sleeve often, especially when working out. This colorful elbow sleeve is made out of rather thick material with rolled and nicely stitched edges. Unfortunately, the support it provides might not be enough for most gym goers. It can do very well for a golf player for example, but if you are into lifting heavy weights you might want a little bit more tension around your elbow. The fabric itself has a nice finish, but it’s a bit too thick. It doesn’t really affect the range of motion, but it makes your elbow too hot and it might become uncomfortable to wear. The grip is not great either. The sleeve will “crawl” down your arm each rep you do so you will have to readjust it after each and every set. So, this is another reason why we believe this was not designed for the athletes. 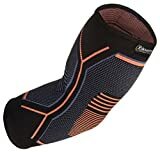 There is an elbow compression sleeve using a 3D knitting technology, which gives it a unique design. The downside of this type of material is that it gets worn out pretty quickly. The inside of it has a rather thick rubber-like material which might feel uncomfortable when you are flexing your arm. The advantage, however, is that it offers excellent grip, so the sleeve will simply not move around at all. Picking the right size can be a little difficult. Based on the user reports, you might be better off with picking a larger size. By choosing the size based on manufacturer’s chart the sleeve will most likely feel too tight around your elbow. Just as the name suggests, it is (roughly) half a sleeve which is specially designed and manufactured to hold you elbow area tight. 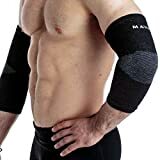 This sleeve will support your elbow joint and tendons, with the purpose of reducing tendonitis pain or the muscle soreness feel. Both conditions are very common in athletes. Depending on its length, it can also offer a little bit of forearm support which can be beneficial sometimes. In athletes, the number one reason for using an elbow compression sleeve is to fasten your recovery after an injury. Exercises such as dips, bench press or triceps extension can put a lot of stress on your elbows and for various reasons (which we are not going to discuss here) can get you injured. By wearing an elbow sleeve and depending on how severe your injury is, you can still train and recover at the same time. The pain is usually reduced quite a bit. An elbow compression sleeve will force your blood to flow closer to your joint and muscles rather than closer to the skin. This help reducing the pain in your joints and can prevent any swelling or inflammation of the tissue. 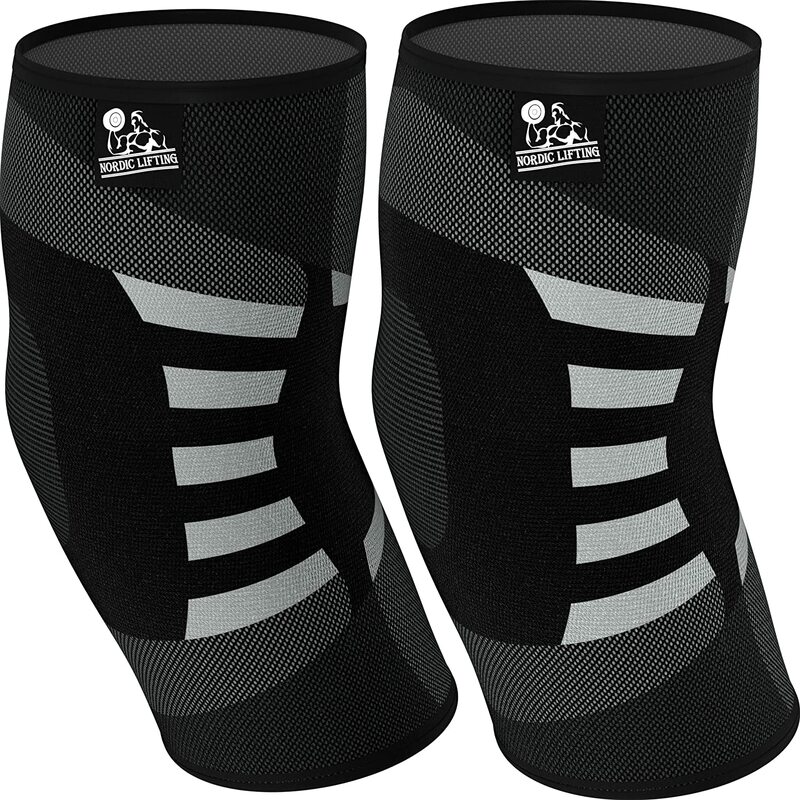 Elbow compression sleeves can also be used to proactively prevent tendonitis or other injuries. By keeping your elbow warm and tight you will be less likely to get your joints in trouble. 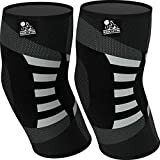 Some people simply use elbow compression sleeves whenever they perform exercises that are heavy on the elbows, even though they are not experiencing any pain or discomfort. Believe it or not, there are quite a few things to check out when you plan on buying an elbow compression sleeve, besides the price. Here are some of the most important aspects to consider. Obviously, you want to buy a product which is made out of comfortable and light material. 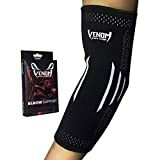 Most of the elbow sleeves are made out of nylon and include a combination of spandex and latex in order to offer a good compression around the elbow. Some products also have some copper inserted in the fabric which is known to help reduce pains that are caused by rheumatoid arthritis and osteoarthritis. These are very rare though and the copper insertion is minimal. On top of that, the grip of these type of sleeves is not very good. The thickness or the fabric is equally important. You don’t want your sleeve to be too thick because it will reduce your arm mobility. Most of the offers include just one sleeve, but sometimes you can find products that come in pairs (so you will get two sleeves). Another thing to look out for is the carrying zipper pouches which are offered for free on some elbow compression sleeves. These come in very handy if you want to keep things in your gym bag well organized. This is the most important aspect to consider. 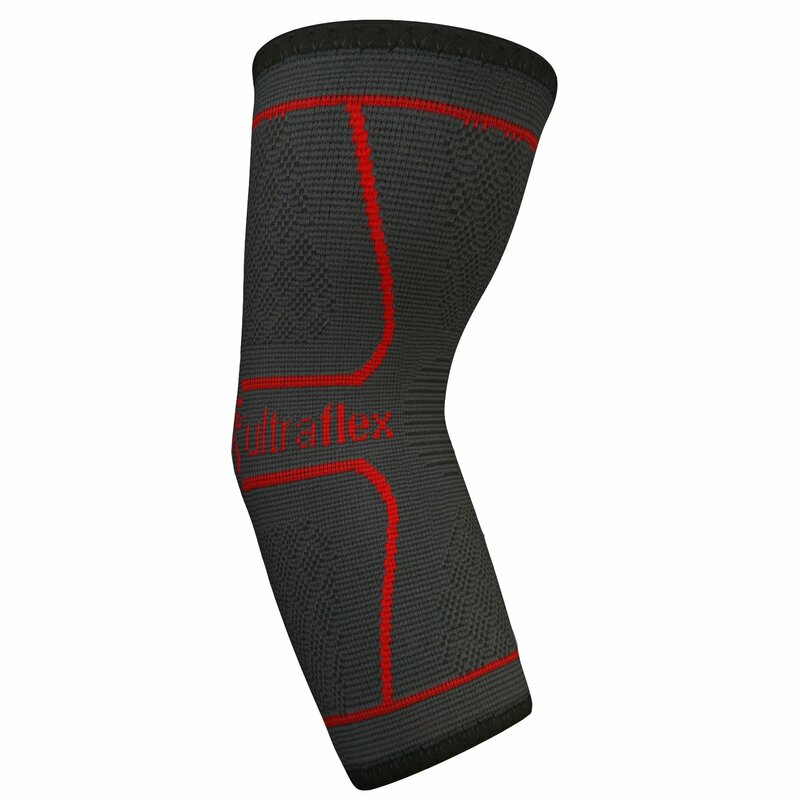 The amount of compression the sleeve puts on your elbow is critical for its effectiveness. You want just the right amount of tension. Choosing the right size and the right fabric is key to getting the optimal tension. If you pick the wrong size you can either feel like wearing a sock on your elbow, with absolutely no tension. Or you can end up with a very tight sleeve which can restrict blood flow and will not allow you to flex your arm properly. Longer elbow compression sleeves will also hug the lower part of your biceps quite a bit. Depending on how tight they are and on how much muscle mass you have, it can actually hurt your biceps when you are flexing it. Another thing to pay attention to is the overall finish of the sleeve. The material should feel comfortable yet firm. Look closely at the stitching on the ends – this is where most sleeves have issues. The ends should have a nice finish that does not hurt your skin. Lastly but not least, you want to pick an elbow compression sleeve which has a very good grip and doesn’t move around. Sleeves with poor grip will slide down your arm as you move it and you will need to re-arrange them all the time. Sleeves with good grip have elastic bands around the ends which hold them in place or have a rubber-like material on the inside which offers good adherence. Now that we have a pretty good idea of what an elbow compression sleeve is and what it should accomplish, let’s review some of the most popular sleeves of 2019. Picking the right elbow compression sleeve is not rocket science after all. You just need to buy the one that puts just the right amount of pressure on the elbow. Just make sure to check out the fabric first, then look very carefully at the sizes they come it. Check out the measurement chart of the product and measure the circumference of your elbow and pick the right size. Also, don’t forget to review what other people have to say about it.